It's a sad day when temperatures in the 90s feel like a breath of fresh air. I don't know what the summer has been like in your part of the world, but we've been cooking here in the Midwest, and it certainly isn't doing anything to help me shed the "hermit" status I've acquired since I started working from home...in fact, it's just made me grumpy. These two fairly iconic recipes hail — at least from what I could dig up — from the 1950s and 1960s, which makes sense for the pie, because that's when the chiffon type really rose in popularity. As for the cocktail, many people agree that it originated at Tujague's, a bar in the French Quarter in New Orleans. Both are still somewhat popular in the South, but, overall, not served much anymore in our fair country. 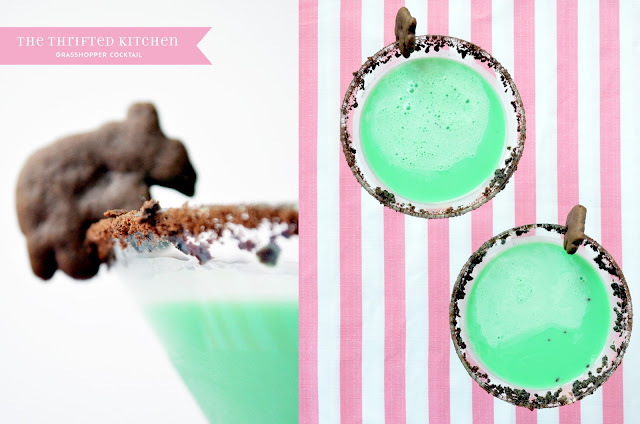 The key ingredient in both is creme de menthe, which gives the dishes a boozy, minty taste that, when combined with the cream, becomes that beautiful shade of green. Traditionally, the pie also has creme de cacao and sits in a chocolate wafter crust, which modern-day recipes often make with Oreos instead of plain chocolate wafers (I went somewhere in the middle and used chocolate animal crackers!). The filling is also traditionally made with gelatin, but people today often use melted marshmallows and cream to avoid the hassle of this somewhat temperamental ingredient. The cocktail is pretty straightforward: creme de menthe, creme de cacao and cream shaken with crushed ice (although the recipe I made uses only white and regular creme de menthe). Some people even take it a step further and add a scoop of mint chocolate chip ice cream into the glass for extra dessert effect. And I have to say, if it weren't for the possibility of becoming a minty alcoholic, I could sip this sweetness every stinking night. 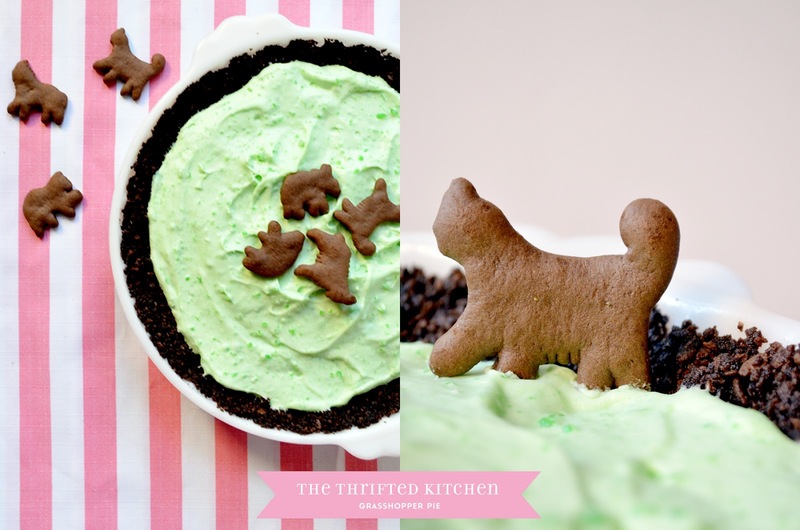 Now, I wouldn't be an honest blogger if I pretended this pie recipe came together effortlessly...cause it didn't. In fact, I think I downed my cocktail during the last quarter of the pie making in an effort to deal with the hot mess that was the aforementioned temperamental gelatin. In the end, though, I did get my pie...and I ate it, too. by Mrs. E.B. Chancey of Union Spring, Ala. Blend 1 1/2 cups crumbs with butter. Press into bottom and sides of a 9-inch pie pan. Dissolve gelatin, 1/4 cup sugar and salt in water in top of double boiler. Add well-beaten egg yolks; cook over hot water until thick. Cool; add creme de menthe and creme de cacao. Congeal until mixture is consistency of egg whites. Beat egg whites until stiff, adding remaining sugar. Fold into gelatin mixture. Fold in whipped cream; pour into crust. Top with remaining crumbs. Chill. Shake with finely cracked ice. Strain into large cocktail glass.